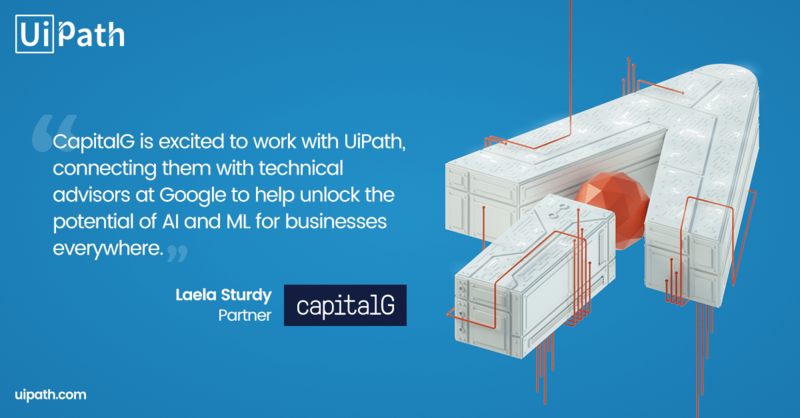 We are thrilled to announce that UiPath has completed a $153 million Series B financing round led by Accel, with participation from CapitalG (formerly Google Capital) and Kleiner Perkins, and with a significant contribution from seed investors Earlybird’s Digital East Fund, Credo Ventures, and Seedcamp. This achievement has been tremendously inspiring as well as humbling for us, because we realized how much UiPath has grown, as a company and as a product. We started our journey in 2005 on a mission to create the greatest possible technology that would eventually enable new ways of working through what was then the emerging field of Robotic Process Automation (RPA). Today, RPA technology has matured into the legitimate and established way to run business processes, but back then it was prepubescent at most. When a technology is this young, the existing solutions are usually not perfect, which in our case meant it was possible to do much better and solve many valuable, yet unresolved problems. Behind our revolutionary approach at the time was our product’s unique computer vision technique. Think of the human visual system, which can detect and interpret information from visible light to build a representation of the surrounding environment. What took evolution millions of years to design eventually inspired technology professionals like us to try to replicate through software. We came up with a solution to capture and recreate automatically some of the actions on the screen that are normally driven by human perception. This is how we brought much-needed disruption to the market, enabling highly reliable automation in difficult scenarios like Citrix. It took us almost a decade to develop this technology. On an evolutionary scale, a decade is admittedly a trifling amount of time, but those have been challenging, formative years for us. We put forth our greatest engineering efforts to accomplish what has now become the most widely adopted RPA Platform, capable of executing reliably to deliver millions of hours of productivity to enterprises. It was our passion for technology that originally brought us to RPA, but it is thanks to our customers and our partners that we have been able to call this industry our home. They are our real raison d’être, and we could never have done this without them. Our company is essentially the result of our collaboration with all of these remarkable people, and our product the outcome of having solved concrete business and IT problems for them. Today, UiPath is a new standard in Enterprise RPA, leading with a cutting-edge Platform whose performance has been validated through phenomenal customer growth – last year we grew our enterprise customer base from less than 100 to more than 700 – through what is now the largest community of skilled RPA users, and through official recognition from global analyst firms. We are in the midst of another record-setting year and this funding represents an incredible opportunity to further grow and solidify UiPath’s leadership position in the market, delivering on our top priorities. The AI world is maturing, but it will not be enterprise-ready soon enough. We want to help carve the way faster and bring the powers of scalability and security along for the journey. This investment will allow us to accelerate our product roadmap – the computer vision we have built into the product is now powered by machine learning – and extend our collaboration with solutions from the AI space that will tie in perfectly with RPA’s agnosticism to create powerful new use cases for our customers’ digital businesses. We will also invest heavily in the expansion of UiPath’s global operations, with a focus on robust product support, customer success teams and sales efforts across all time zones and geographies, to benefit our customers as well as our partners–counting more than 200 today and including strong alliances such as Cognizant, Deloitte, KPMG, PWC, and TCS. A big thank you to Accel, CapitalG, Kleiner Perkins, Earlybird, Credo Ventures, and Seedcamp for their confidence and support. Now a new adventure begins, and we are confident that we will work together to grow UiPath further and shape how businesses operate in the digital age. Learn about Enterprise RPA and how it will impact your business in the long run.